Cuando se inició la Revolución Mexicana un norteamericano, Paul Mason, simpatizante de la causa, decidió reunir a un grupo de jóvenes compatriotas y lanzarse a luchar con los mexicanos dejando atrás a su novia, Ethel Davis. Caminando con su perro por la estación de ferrocarril, Ethel queda atrapada en un carro al intentar sacar a su perro que se le había escapado. Doce horas más tarde el tren que había salido del pueblo se detiene en el interior de México donde se hallan soldados federales. Uno de ellos encuentra a Ethel y ella ruega al general Álvarez que la regrese a su país. Éste le explica que los insurgentes tienen controlada toda la vía del tren y pone a Ethel bajo el cuidado de su esposa. A Prisoner of Mexico (Oct. 23). – When the Mexican Revolution stroke out Paul Mason’s sympathies for the Insurgents led him to volunteer his services in assisting their cause. Gathering a number of adventurous young Americans, he took leave of Ethel Davis, his sweetheart, and started for Mexico. A few days after Paul’s departure, Ethel meets with a peculiar accident. As she walks past the railroad yards in her San Diego home, her pet dog becomes attracted by something within an open box car, which he proceeds to Investigate. Ethel follows her pet, but no sooner enters the car than the door is closed by a railroad employee, who knows nothing of what has taken place. 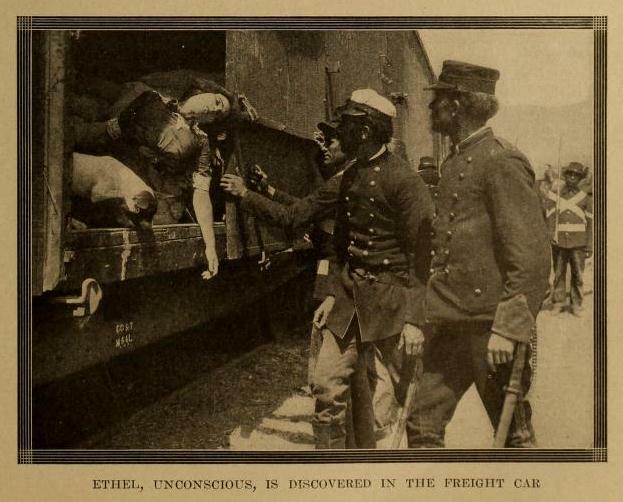 The train is made up and starts on its journey with Ethel a prisoner within the closed box car. 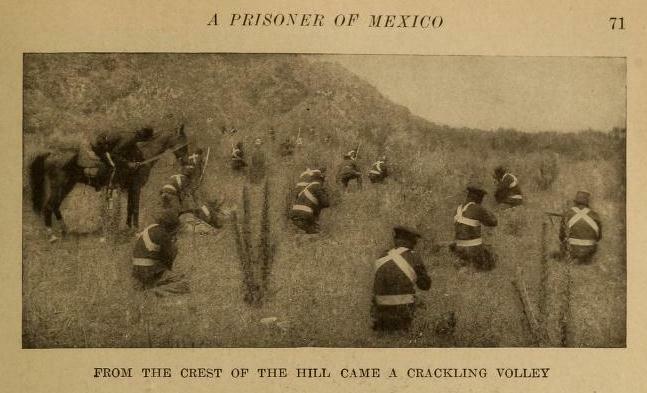 Twelve hours later the train halts at a small town In the Mexican interior where Federal soldiers are quartered. In passing the train a soldier hears a cry within one of the cars. The door is opened and Ethel, weak and exhausted from her imprisonment, is lifted to the ground. She begs to be returned home, and General Alvarez explains that the Insurgents have control of the railroad line. Ethel is placed in care of the wife of the Federal jailer. Just at this time the insurgents’ pack train starts out to carry supplies to a besieged town nearby. Paul gathers his men and escorts the train. 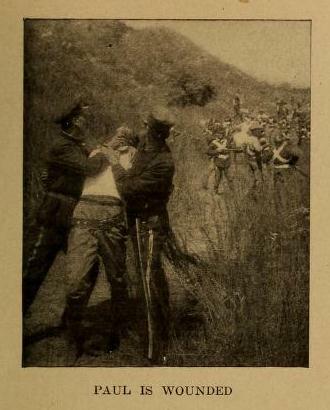 A troop of Federals discover the party and overtake them after a sharp fight. Paul is led away a prisoner. At the jail he is recognized by Ethel, who affects his escape. The two fugitives are discovered and followed by the Federals, whose rifle shots are heard by the Insurgents. The Insurgents come to the rescue of the two Americans and put their pursuers to rout. The end of hostilities enables Paul to conduct Ethel to their American home. 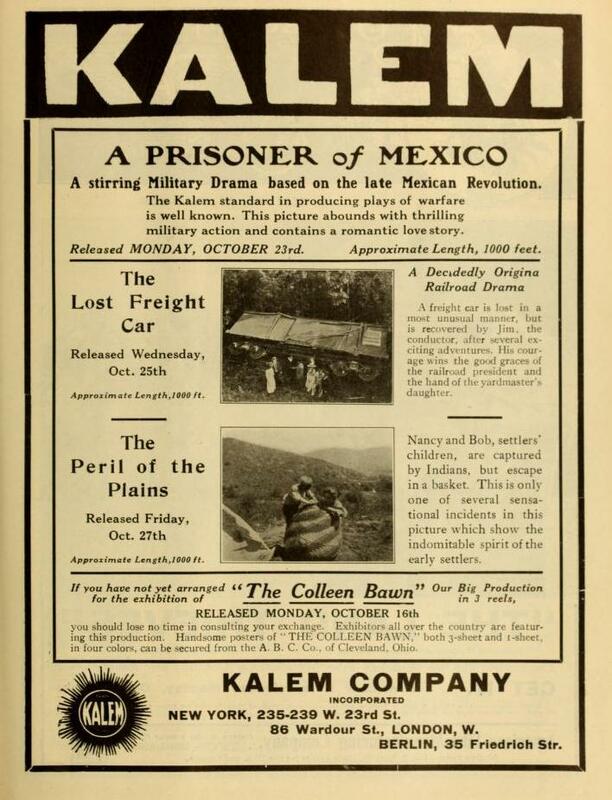 “A Prisoner in Mexico” (Kalem), October 23.—A very romantic adventure during the recent disturbances in Mexico. Both the hero and the heroine of the picture are Americans. The man is an insurrecto and captain of the “American Legion,” a troop of adventurous horsemen. The story tells how both he and his old sweetheart happened to be in the hands of the Mexican Federals. The girl helps the man to escape from his prison. In the pursuit, over the nearby hills, the two are nearly retaken, but are saved. The “leader” reads: “The American Legion to the Rescue.” It is not a very ably designed picture, but it is not dull. The audience watched it in silence, but it seemed to be following it, which isn’t done always when conventional “Westerns” are on the screen. 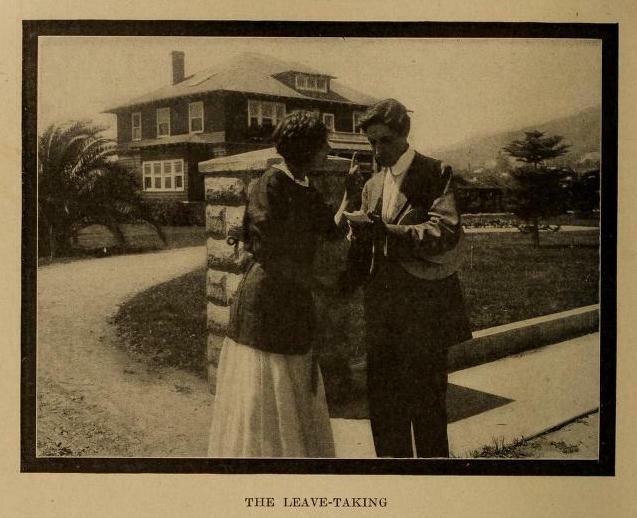 Cabe mencionar que The Motion Picture Story Magazine de noviembre de 1911 (Vol. II, No. 10, pp. 65-71) publicó una narración basada en la cinta y escrita por Emmett Campbell Hall con varios fotogramas de la película, los cuales aparecen publicadas aquí.